Update (22 Sep, 2016): Steam have been listening. Complaints about the user reviews scores have prompted Valve to change the default rating for each game from the “Steam Purchase” only score to the ‘All’ score. If however, you prefer to see just the Steam Purchased reviews or just the ‘Key Activated’ reviews, then simply scroll down to the review options, change it once, and Steam will remember your preference. Another change is with the ‘Mixed’ reviews, at the request of developers this been changed to a yellow colour instead dark red/orange. This may sound like a minor change but I understand why it would be important to some devs. The previous colour for mixed reviews had been too close to the colour of ‘bad’ reviews, which did seem a little unfair. Other review sites such as Metacritic have remained unchanged for years, despite ongoing complaints of biased scores though of bought reviews, and review bombing by some gamer groups. It’s good to see that Steam are taking feedback for their system seriously. If they keep reviewing the system and implementing changes regularly they will stay on top of bogus reviews, and keep their own customer reviews alive and relevant for a long time to come. Original story (16 Sep, 2016): Steam, having updated their customer review system earlier this year to include ‘recent’ reviews with a separate rating, have updated their review system once again. 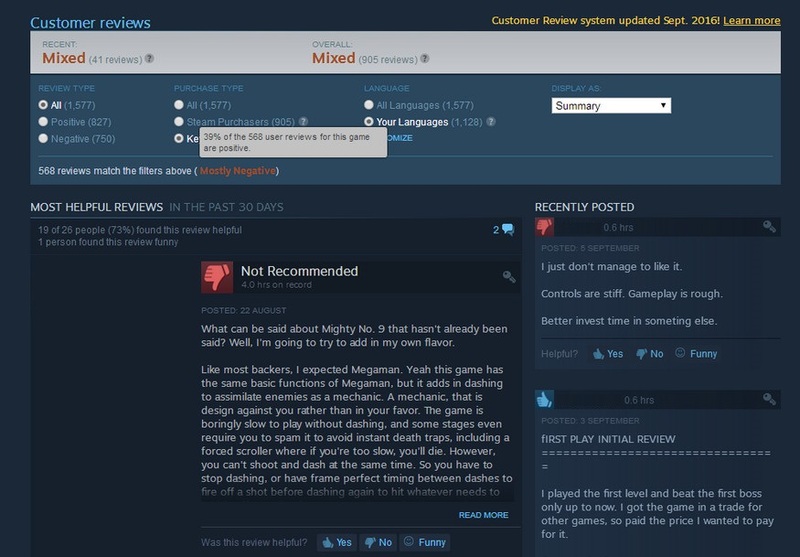 The latest changes to Steam reviews are nothing to get worked up about, however not everyone agrees with this view. The key change to the new system is with Steam Key origins being segregated and given separate ratings. What Steam claims they’re trying to do is give customers a way to spot when a review comes from a different source with vastly different ratings. 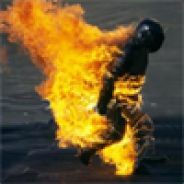 Steam also claims with their newest update, that some developers have become too obsessed with the Steam review ratings system and may try various ‘shady’ practices in order to artificially bump their review scores, such as creating fake accounts and giving them free keys, and even employing ‘businesses’ to give good ratings. In fact Steam goes as far as saying that over 160 titles on their store have vastly different ratings with reviews from key activations (the inference being that these 160 games have manufactured their scores). Now the downside to this system is obvious – people who buy many of their games through outlets other than steam, are going to feel like second class customers, and this may in turn hurt revenue for those outlets. A second drawback is with new games that have built up healthy customers bases from Kickstarter or other independent ways prior to being released on Steam. Such games often promise Steam keys as awards for early backers, or as loyalty rewards, and these will fall into the trap of being counted as ‘purchased outside of Steam’. These enthusiast reviews are naturally more positive than average reviews. Two games that I know have benefitted from enthusiast reviews this year are: Factorio and Rimworld. With Factorio receiving a 98% from steam purchase reviews and 99% from key activations and Rimworld having 95% steam purchase reviews and 99% from key activations. Now I’m not suggesting for a second that Factorio’s or Rimworld’s “imported” reviews have been manipulated, it’s clear that both of these are great games that don’t need to manufacture their score. It’s only natural that these games’ most enthusiastic players were keen to give them great reviews the moment they could. Of course the opposite can also be true. Despite having a massive fan base and nearly $4m from backers on Kickstarter, Mighty No 9 fell far short of expectations, and its fans didn’t fail to make their complaints about the lacklustre game in their Steam reviews. So the truth is, an outside/homegrown customer base, may give a slightly more positive rating than the usual Steam reviews, giving it a mere 39% compared to the average Steam Purchase review of 60%. It’s clear that key activation reviews are at least more polarised than the average reviews, if not more useful too. If these reviews are useful then they should not be discarded along with possibly bogus ones. But unfortunately they’re not. It’s still relevant, you can trust fans to give an honest opinion. I said earlier that there was nothing to get worked up about, and that’s down to one simple fact: the excluded reviews have not been excluded. For the discerning Steam enthusiast, it’s a matter of seconds to scroll down a game’s Store page and switch the review setting from Steam Purchasers to All or even Key Activations. It’s true that reviews are now automatically set to initially display only the Steam Purchases rating, but this is a feature that even casual Steam users will learn to differentiate. In my opinion it’s better to have the information, because there are dev scammers and professional rating fixers, there are also fanboys and even troll groups that try and manipulate a game’s score, but information is your friend. The more you have the better choices you can make. Of course this is an evolving system, and just as four years ago when the only way to manipulate a review was to pay off an unscrupulous magazine reviewer or YouTuber, in another year from now I expect the scammers will have adapted again. The one constant that gives me hope and keeps most scores accurate and most devs honest, is that most gamers, indeed most people, are inherently honest. So here’s to us, here’s to honesty, some people call it naivety, but the truth is we’re the ones keeping the whole thing working. We’re the ones selling hope not cynicism, and we’re the ones that deserve a pat on the back right now. Go on, you’ve earned it. Really? I mean really?! 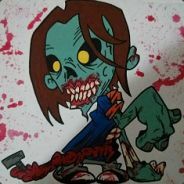 Valve is becoming a horrible company that doesn't give a damn about us. Yes it updated the policy but its only because it didn't cost them anything and there was a huge fallout. If it was only the pressure from users I am sure they wouldn't have moved a finger (unless you count the middle finger) but I bet it was the developers/publishers who made valve change it. You can say all kinds of things about Valve/Steam, but you gotta admit.. dispite some boneheaded things (this rating mess, paid DLC etc.) they do end up listening to the customer and put things back in order eventually. That's gotta count for something? Right?